I am wearing a dress! I think this is the first post of me wearing a dress. I am typically a jeans person - as you can probably tell from all of my different style posts of jeans. If I am not wearing jeans, I usually wear a dress or skirt. I am not really a dress pant type (or even shorts) person. I picked-up this striped dress at Forever 21 for under $15 - and I love it! 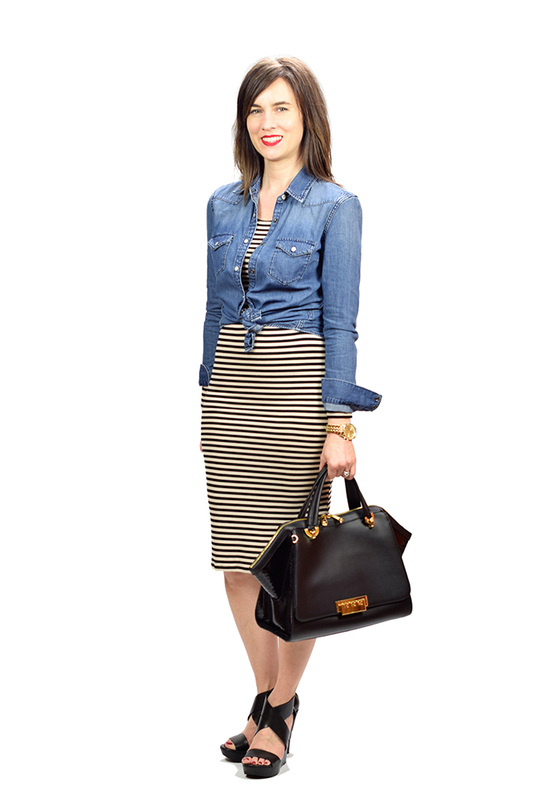 I wanted to style it kind of fun, so I decided to try my denim shirt worn over the dress and knotted at the waist. I am also wearing my comfy (really tall) wedge sandals - I have linked some almost identical ones for under $80. 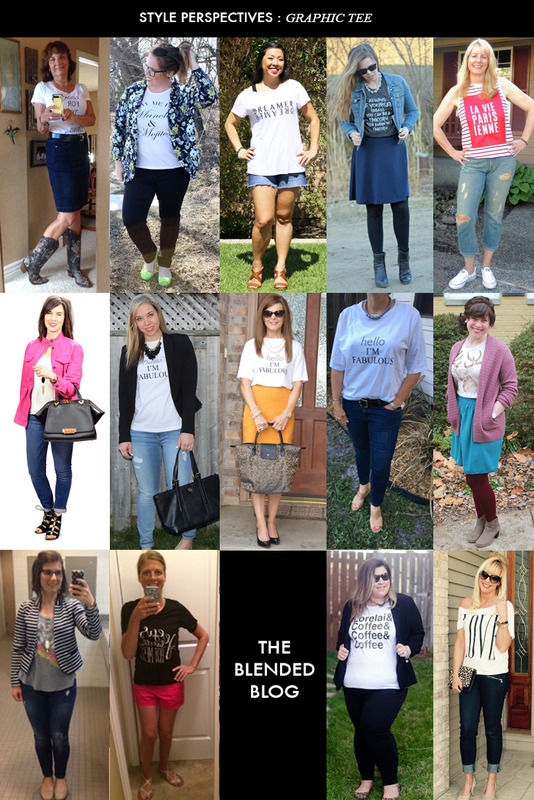 Also, this is a double-style post today because it is Wednesday, which is Style Perspectives with The Blended Blog. Our host is Alison from Puppies & Pretties. The prompt Alison chose this week is PLAID. Below, I am showing a couple of ways I have worn plaid in a few of my Instagram posts. If you are interested in knowing what I am wearing in my Instagram posts - most of my Instagram photos are linked to a tool called LIKEtoKNOW.it. If you are not familiar yet with LIKEtoKNOW.it - it is an easy way to shop my Instagram posts directly. All you have to do is "Like" my post (once you have signed up), and then it will send you an email with product links. 1. Go to LIKEtoKNOW.it and sign-up. (Note: You do not need to follow me on LIKEtoKNOW.it. 4. And, an email with all the outfit details will be sent to your inbox. 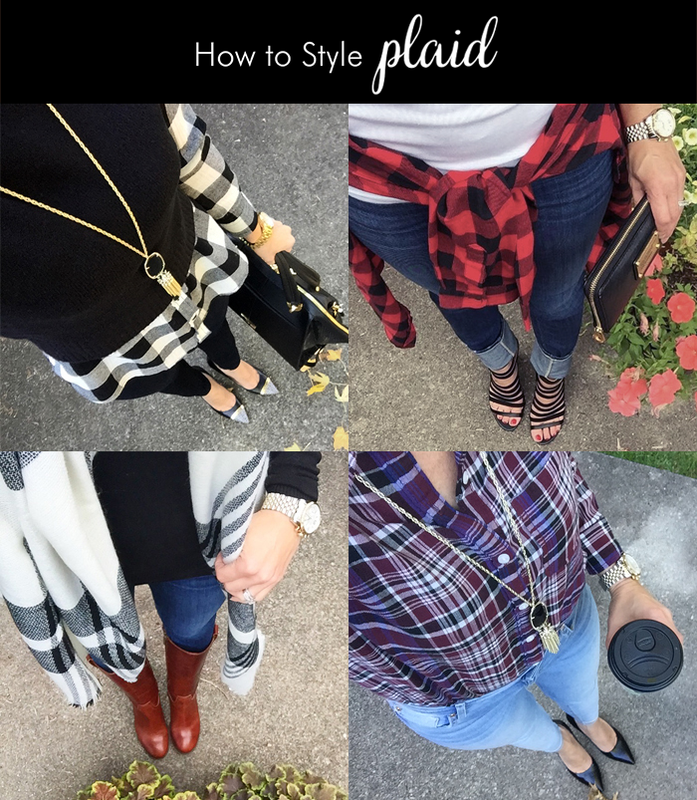 Be sure to LINK UP your plaid look. 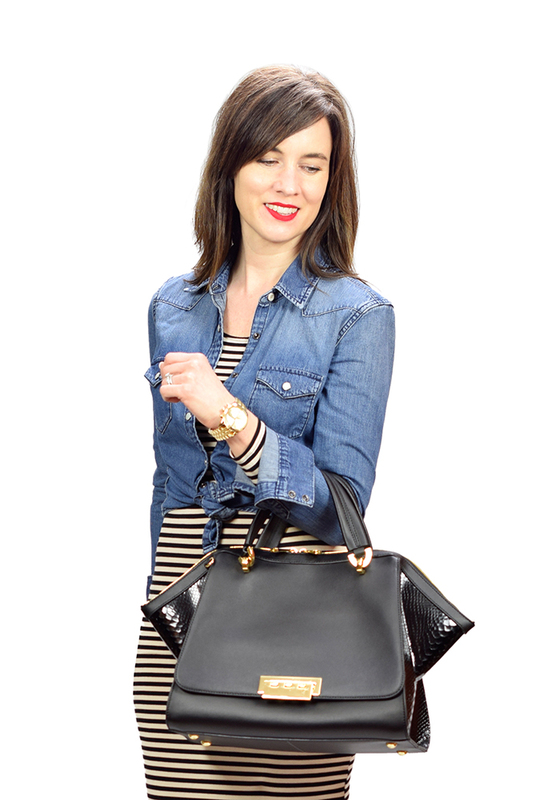 And, hop over to The Blended Blog to see how Alison styled her plaid look. Aren't we a fun group of bloggers? Six of these bloggers met in Vegas last week for a conference - which you can read more about here. 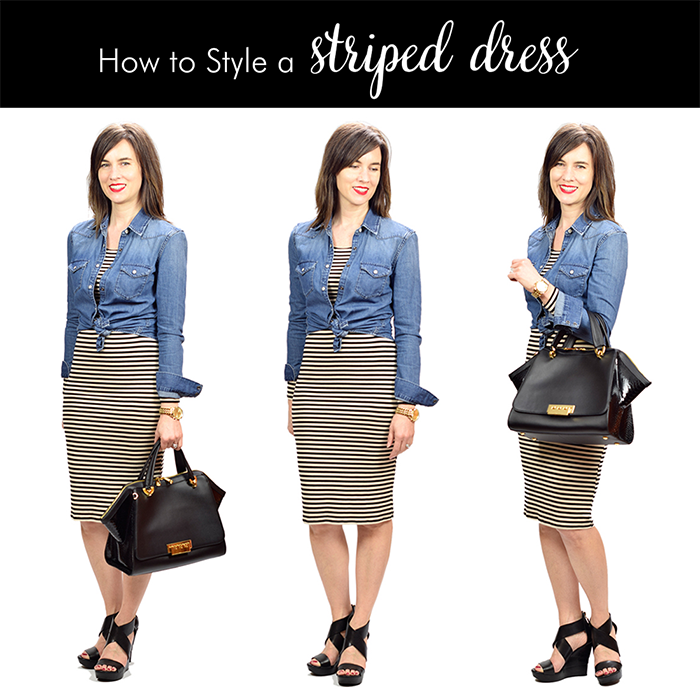 You look amazing in this striped dress! You should definitely wear dresses more often! Thank you! I am going to try more dresses, we will see! I love all 4 looks out of your little plaid collage, but lets talk about that striped dress. LOVE that look, and again I think I've said this before but those shoes are so great. Gosh, your striped dress look is so spot-on. Coincidentally, I laid out a striped dress to wear to work today. Might try adding a chambray with it, to follow your good lead. Lovely plaid suggestions, too. I love that you tied in your previous Insta plaid looks. Also, yay for the dress!!! I LOVE that striped dress on you, it's soooo flattering!!!!! Wow! You look great in that dress! And what a steal! I need my dresses to have more of an A line to it but you wear this straight one so well! And I love it with the denim shirt! Your plaid looks are all fab but I would be sweating in them here! haha! Love the dress with the tied chambray! You should definitely wear dresses more often, because this is gorgeous on you! That dress is amazing with the denim tied, I did a post similar to this last year and it's one of my favorite outfits! You look stunning, the fit and style is so flattering on you! And your little denim collage is absolutely darling! very cute look! I love your wedge sandals! perfect for so many looks! You have done a fantastic job of styling this classic midi striped dress and I am just in love with those wedges, Lisa. Great plaid looks too. How do you get such nice Instagram photos? You pull of that bodycon dress SO well! I like how you've made it a bit more casual with the chambray shirt! What a great dress! I love the length and those wedges are fabulous too! Great dress! I love wearing a great striped dress! It's so versatile! And I love all of your plaid looks! That dress looks fab on you! and I think all of your plaid looks are too cute! I have two plaid shirts and the other one I feel I can only wear during Christmas time else I'll look like an elf. Such a perfect everyday look! Love those wedges! Well, what's not to love in all of these looks? Nothing! You look great in everything! I always love all your looks!! What a great dress and I love it with the chambray shirt tied at the waist.